New office space in downtown Toronto will continue to be hard to come by until the results of the latest major development cycle come to fruition in 2020 at the earliest, according to a new report from Newmark Knight Frank Devencore (NKFD). 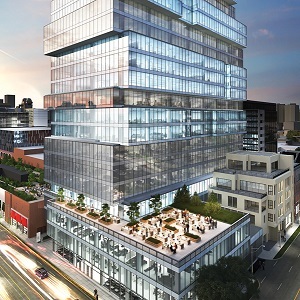 First Gulf’s Globe and Mail Centre is one of three major office developments being delivered in Toronto in 2017. “It’s a vibrant market downtown and I don’t see anything happening to change that on the horizon, but there could be one world event where everything could be turned upside down,” said Allan Schaffer, the president/broker of record of NKFD’s downtown Toronto office. Nearly 10 million square feet of office space has been delivered to downtown Toronto over the past decade, bringing the inventory to almost 75 million square feet. An additional 3.5 million square feet is under construction. The vacancy rate for all office classes was 6.5 per cent at the end of the first quarter, about the same as a year earlier, but with approximately 1.2 million square feet of new inventory added to the market. Schaffer expects that rate will stay steady or decrease slightly until buildings now under construction open. Most of the newly built space has been absorbed and the three new office developments that will be delivered in 2017 — First Gulf’s 500,000-square-foot Globe and Mail Centre at 351 King St. E., Oxford Properties Group’s 900,000-square-foot EY Tower at 100 Adelaide St. W. and Menkes Developments’ 800,000-square-foot One York Street — are already more than 95 per cent pre-leased. The only other major downtown developments scheduled to be delivered before 2020 include Allied Properties REIT (AP.UN-T) and RioCan REIT’s (REI.UN-T) King Portland Centre at 620 King St. W. and Daniels Waterfront – City of the Arts’ West and East Towers at 130 Queens Quay E.
The King Portland Centre is a mixed-use development with approximately 254,000 square feet of office space. Shopify (SHOP-T) has signed on as the lead tenant, and just 18,500 square feet remains available. Daniels Waterfront – City of the Arts will offer almost 400,000 square feet of office condominium space. Less than 120,000 square feet remains unsold. Up next after those are Ivanhoé Cambridge and Hines’ CIBC Square (formerly known as Bay Park Centre) and Cadillac Fairview’s 16 York. CIBC Square, which officially broke ground Wednesday morning, is a two-tower, 2.9-million-square-foot development near Union Station. Its first LEED Platinum-targeted tower, to be built at 81 Bay St., will include 1.5 million square feet of office space. CIBC has already committed to a total of 1.75 million square feet, which will likely free up space in its Commerce Court offices. The 879,000-square-foot 16 York, in the South Financial Core, is also targeting a LEED Platinum certification. Construction is scheduled to begin this summer and it’s being built on spec, a reflection of the developer’s confidence in the strength of tenant demand for large blocks of space featuring contemporary amenities. Schaffer doesn’t think other developers will follow suit. He points out there was talk of CIBC Square being built on spec, but construction was delayed until CIBC came on board. “There are some other projects on the drawing board that are waiting for a lead tenant,” said Schaffer. * and Torex Gold Resources Inc.’s 11,750-square-foot renewal at Brookfield’s The Exchange Tower. The average gross rent for all downtown Toronto office classes has continued to climb and is at $42.95 per square foot, up from $40.87 a year earlier. Schaffer believes there’s room for more growth in rents and that some tenants will pay a premium to keep all of their operations in the same building if they’re expanding. Space is also tight to the east and west of the core, according to Schaffer. Schaffer said there may also be opportunities for developers to build new office space on top of older existing buildings in downtown west and downtown east. Downtown Toronto is also undergoing a boom in new condo buildings, which is reducing available development opportunities, and some landlords are including 12-month demolition clauses in their office leases. This leaves them free to undertake office-to-condo conversions should an opportunity arise. NKFD is Canada’s largest corporate real estate advisor and brokerage, exclusively representing corporate, industrial and retail space users.